On 1 November 2018, the 20,000th fishing trip logsheet was uploaded using the Tails data entry app, marking a significant milestone for tablet-based, small-scale fisheries data collection in the Pacific Islands region. In a serendipitous twist of fate, the same data collector who uploaded the 20,000th logsheet also uploaded the very first Tails logsheet back in 2016 during the first field trials. Looking back over the last few years, there has been significant progress in the region towards improved small-scale fisheries data collection, and a push from Pacific Island countries and territories to use these data for decision- making within fisheries management. Fisheries data management staff at the Pacific Community (SPC) had been running some routine reports and noticed that the number of logsheet uploads via Tails was approaching 20,000. Who would submit the 20,000th logsheet? Would it be sent from a community-based fisheries manager in remote Vanuatu, entering caught yellowfin tuna from a locally designed and built ‘vatuika’ fish aggregation device? Would it be submitted from the wharf in Rarotonga, with a fisheries officer sampling a few mahi mahi caught by tourists from Auckland as part of the island’s thriving tourist industry? Or could the logsheet be submitted from a data collector in Tonga, entering a catch of wahoo from the local small-scale troll fishery? As it turned out, the 20,000th logsheet was submitted by Slade Benjamin, a fisheries data collector with Nauru fisheries who assisted with the very first version of Tails, and collected the very first Tails logsheet from a local fisher who had caught a wahoo and snapper while fishing from of a small boat before work. Slade was instrumental in the early testing of Tails and in providing feedback on the first designs and ideas in order to get Tails to where it is today. Looking back at several years of data collection, and those 20,000 logsheets, gives perspective to the rapid uptake and effort that Pacific fisheries offices have invested into this kind of data collection. These logsheets contain a huge amount of small-scale fisheries data, made possible by the many thousands of hours that data collectors spend waiting at landing sites to collect data, interview fishers and measure catches. An impressive amount of data collection for a tool that was only first tested in 2016. As the data collection programme matures, and the time series of data increases, these data become more and more useful for fisheries and social purposes. These data inform the coastal fisheries report card, are used to report total removals of tuna to the Western and Central Pacific Fisheries Commission, and in some cases the collection of reef species has helped inform local fisheries management decisions. Less than three years after the first Tails logsheet was developed, there are now close to 100 data collectors operating in 10 Pacific Island countries and territories, with 451 unique species logged, and 564,092 kg of fish recorded. These data have been used for important management decisions, as well as tracking nearshore the effectiveness of fish aggregation devices, and reporting small-scale tuna catches to the Western and Central Pacific Fisheries Commission. For more information: contact Andrew Hunt, Data analyst – Trainer, FAME, SPC. SPC is the sole copyright holder of this article. Scientists from throughout the Pacific meeting this week in Hilo on the island of Hawai’i have made their recommendations on federally managed fisheries of Hawaii, American Samoa, Guam, the Commonwealth of the Northern Mariana Islands and the US Pacific Remote Islands. The Scientific and Statistical Committee (SSC) of the Western Pacific Regional Fishery Management Council will conclude its meeting later today. The SSC recommendations will then be considered by the Council at its 174th meeting to be held Oct. 23 and 24 in Saipan, CNMI, and Oct. 26 and 27 in Guam. Under the Magnuson-Stevens Fishery Conservation and Management Act of 1976, the Council has authority over fisheries seaward of state waters in Hawaii and other US Pacific Islands. During the first two days of the meeting the SSC specified annual biological catches for a suite of managed species. The Council will consider the annual biological catch specifications in recommending annual catch limits for these species. The annual catch limits can be equal to or lower than the annual biological catches set by the SSC, depending on management uncertainties. The council’s catch limit recommendations will be transmitted to the Secretary of Commerce for final approval. The SSC noted the general under utilization of the stocks for which it specified biological catch and discussed how best to incorporate this into catch limit specification with little to no fishing effort. The SSC also noted that under-reporting continues to be an issue for most of these stocks. The last deep-water shrimp assessment was in 1988, and there is a clear need to update the maximum sustainable yield for this stock. The SSC also recommended refining the essential fish habitat for precious coral in the Hawaii Archipelago and updating the essential fish habitat information for the Fishery Ecosystem Plan for the Hawaii to incorporate new data from submersible research dives. For deep-water precious coral (e.g. pink and bamboo), the SSC recommended defining the geographic extent of precious coral essential fish habitat based both the existing essential fishing habitat beds as well as the newly identified beds. For the shallow water precious corals, the SSC recommended updating the essential fish habitat definitions with the habitat characteristics and geographic extent. This description would increase the percentage of precious coral observations contained within the essential fish habitat areas of the MHI from 56 percent to 92 percent. The SSC noted that bottom current is important to understanding precious coral habitat, but data on the bottom current data is not available now or in the foreseeable future. A ten-day annual operation to detect, deter, report and/or apprehend potential illegal, unregulated or unreported (IUU) fishing activity ended on August 3. Operation Island Chief involved ten FFA member nations- Fiji, FSM, Kiribati, Palau, PNG, Nauru, the Marshall Islands, Solomon Islands, Tuvalu, and Vanuatu, and the Quadrilateral Defence Coordination Group (QUADs) – Australia, New Zealand, France and the United States. Regional surveillance operations such as Operation Island Chief involve hundreds of personnel from across the region, with joint coordination led by the FFA’s Regional Fisheries and Surveillance Centre (RFSC) team. Fisheries, Police Maritime Units and Navy officers of FFA members participated as watch-keepers joining the RFSC team for around the clock shifts during the Operation, with their primary task being to monitor and analyse the Regional Surveillance picture and all incoming data from the QUAD surveillance providers. OPIC18 is the third of four Pacific Islands Forum Fisheries Agency (FFA) led monitoring, control and surveillance operations each year. It involved patrol boats from Fiji, Palau, Papua New Guinea, Solomon Islands, Tuvalu and the Marshall Islands, as well as aircrafts from Australia and the United States, who offered their defence and military assets to support regional surveillance. A total of approximately 50 days at sea and 110 hours of air time was undertaken during OPIC18. “As always we are thankful for the level of cooperation, commitment and engagement by our members and QUAD partners in safeguarding the Pacific fishery from Illegal, Unregulated and Unreported activity” said FFA Director General, James Movick. IW:LEARN is the Global Environment Facility’s (GEF) International Waters Learning Exchange and Resource Network. The Pacific Islands Forum Fisheries Agency (FFA) hosts the GEF funded “Implementation of Global and Regional Oceanic Fisheries Conventions and Related Instruments in the Pacific Small Island Developing States Project”, known by its abbreviation as the Oceanic Fisheries Management Project II (OFMP II). The Project is the third GEF funded marine resources initiative in the Pacific region and builds on the successes of the first two projects with a focus on Pacific SIDS participation in sustainable oceanic fisheries in the Western and Central Pacific Ocean (WCPO). In the context of the programming directions for International Waters in the GEF, the project makes significant contributions to FFA activities in support of both the blue economy and improving the management of Areas Beyond National Jurisdiction (ABNJ). Cooperation in the management of tuna fisheries by Pacific Island countries is a direct application of the principles of the blue economy. This concept aims to promote economic growth, social inclusion, and the preservation and improvement of livelihoods while at the same time ensuring environmental sustainability of the oceans. It is closely linked with Sustainable Development Goal 14, specifically 14.4 and 14.7. The Western and Central Pacific Ocean (WCPO) tuna fishery is the largest tuna fishery in the world and the 2.7 million ton annual WCPO tuna catch accounts for sixty percent of global production with sixty percent of this catch coming from the waters of FFA Members. Tuna fisheries are a key resource for all Pacific Island countries – for many the only renewable economic resource. The WCPO is the only tuna fishery on the planet in which all four target stocks are currently rated as sustainably fished with no overfishing occurring. The Vessel Day Scheme (VDS) is a fisheries management system that establishes rights in the shared fishery for coastal state and has been driven by the Parties to the Nauru Agreement (PNA), a sub-regional grouping of FFA member countries. The consolidation of VDS which allows members to sell the rights to purse seine fishing days in their waters has seen SIDS revenues from the purse seine fishery increase from from 220 million in 2012 to 480 million in 2016, accounting for more than 40% of government revenue in five member SIDS and supporting 25,000 jobs in FFA Member countries in 2017. Of those employed in the processing sector 80% are women. The Regional Fisheries Surveillance Programme is a unique collaboration between the members of the Forum Fisheries Agency (FFA) to address illegal, unreported and unregistered (IUU) fishing in support of SDG 14.4. A range of regionally agreed systems and tools and best practice technology applications provide a high level of monitoring, control and surveillance and the agency is active in a range of activities supporting IUU mitigation such as the implementation of electronic monitoring and reporting systems on WCPO vessels. In terms of activities supporting improved management of Areas Beyond National Jurisdiction (ABNJ), the OFMP2 project supports the annual FFA Management Options Consultation (MOC) meeting in which FFA Members Countries actively participate in WCPFC decision making and includes the improved management of ABNJ. MOC processes have provided the opportunity for supporting the adoption of high seas Special Management Areas and promoting strengthened catch and effort limits on the WCPFC high seas for tropical tuna fisheries, as well as an allocation process that will take account of the WCPFC Convention’s recognition of the special requirements of SIDS. OFMP2 has also assisted PNA countries to develop the capacity to implement their prohibition on PNA-licenced purse-seiners from fishing in the two western high seas pockets. Wider FFA promoted and supported measures such as FAD closures, 100% observer coverage in the purse seine fishery and coordinated approaches to high seas boarding and inspection activities also support more effective management of Areas Beyond National Jurisdiction. The GEF OFMP II is a key contributor to the success of the blue economy in the WCPO. This story provides an illustration of how GEF IW projects are already addressing themes in the new GEF IW strategy for the 7th GEF Replenishment. In this case the story highlights how projects can address Objective 1. Strengthening Blue Economy opportunities. In GEF-7, investments will be strengthening nations Blue Economy opportunities, through three areas of strategic action: 1) sustaining healthy coastal and marine ecosystems; 2) catalyzing sustainable fisheries management; and, 3) addressing pollution reduction in marine environments. The eight Pacific Island nations and territory in the Parties to the Nauru Agreement (PNA) tuna fishery, the world’s largest, have organized the tuna industry’s first large blockchain initiative, promising to give retailers, consumers and environmental groups information about vessels, captains, locations of harvest and when fish was processed. The development was announced at the SeaWeb Sustainable Seafood Summit, in Barcelona, Spain, this week by Pacifical, the market development company that represents the eight nations, including the Federated States of Micronesia, Kiribati, the Marshall Islands, Nauru, Palau, Papua New Guinea, Solomon Islands and Tuvalu, and also the territory of Tokelau. The initiative, which is set to be launched by the end of July, is being developed with the help of Atato, a Thailand-based provider of blockchain services. The fishery represents 25% of the world’s tuna landings, according to a press release. The initiative will cover more than 100 large fishing vessels and “the entire supply chain and chain of custody of about 35 million tuna fish caught annually in an area with a surface 40% bigger than Europe”, the release said. The 15th Infofish World Tuna Trade Conference and Exhibition opened on 28 May in Bangkok, Thailand. The three-day conference covered resources, fisheries management, markets, new technologies, food safety, sustainability, and environmental issues. Among the sponsors was the Food and Agriculture Organization of the United Nations (FAO). Jong-Jin Kim, FAO’s deputy regional representative for Asia and the Pacific, said during his opening address that the international community now has at its disposal a number of new and powerful instruments with the potential to drastically reduce and eliminate illegal, unreported, and unregulated (IUU) fishing, including the FAO Port State Measures Agreement (PSMA), the FAO Voluntary Guidelines on Catch Documentation Schemes and the FAO Global Record of Fishing Vessels. FAO Fishery Planning Analyst for Asia and the Pacific Cassandra De Young explained the various programs to SeafoodSource. The 2009 FAO Agreement on Port State Measures (PSMA) is the first binding international agreement to specifically target IUU fishing. Its objective is to prevent, deter, and eliminate IUU fishing by preventing vessels engaged in IUU fishing from using ports and landing their catches. Entering into force in June 2016, 54 States and the European Union have joined forces by becoming Parties to the PSMA, as of May 2018. FAO Voluntary Guidelines on Catch Documentation Schemes were officially adopted by the FAO Conference in July 2017 and, with seafood trade at record highs and consumer demand still rising, CDS are increasingly seen as an effective tool. For example, since 2010, the European Union has used a CDS that covers all fish shipments imported into the bloc from overseas; and in 2016, the United States announced its own scheme, the Seafood Import Monitoring Program (SIMP). In 2017, ASEAN adopted the voluntary ASEAN Catch Documentation Scheme for Marine Capture Fisheries to enhance intra-regional and international trade of fish and fish products. “The FAO Voluntary Guidelines on Catch Documentation Schemes is the first international policy document that provides a ‘gold standard’ for governments and businesses looking to establish systems that can trace fish from their point of capture through the entire supply chain – from ‘sea to plate’ – in order to stop illegally caught fish from entering the marketplace,” De Young said. The Global Record of Fishing Vessels, Refrigerated Transport Vessels and Supply Vessels (the Global Record) is a collaborative, global initiative to make available, in a rapid way, certified data from State authorities about vessels and vessel-related activities. The Global Record provides a single access point for information on vessels used for fishing and fishing-related activities with the primary objective being to combat IUU fishing by enhancing transparency and traceability. Key to the Global Record, De Young said, is the Unique Vessel Identifier (UVI) – a global unique number that is assigned to a vessel to ensure traceability through reliable, verified, and permanent identification of the vessel. Once assigned, the UVI is with the vessel for its entire life, regardless of changes in flag, ownership, or name. To date, IMO numbers have been allocated to more than 23,000 fishing vessels worldwide. Countries are closing the net on IUU fishing as countries around the globe, De Young said, calling out Argentina, Brazil, Chile, Colombia, Ecuador, El Salvador, Guatemala, Panama, Peru, Thailand, the United States of America, Vanuatu and the European Union member states for praise, as all have started disseminating their data through the Global Record Information System. Launched in April, 2017, the Global Record initially includes larger vessels (100 gross tonnage, or 24 meters and above) but aims, over time, to include official information on vessels all the way to 10-50 GT or between 12 and 18 meters. Japan is the second-largest contributor to the FAO’s budget. Keiko Okabe, a communication specialist at the FAO’s Japan Liaison Office, said FAO’s leading initiatives in Japan including implementation of Globally Important Agricultural Heritage Systems and zero hunger initiatives funded by Japan’s Ministry of Agriculture, Forestry, and Fisheries (MAFF). “The FAO, as a whole, has been implementing a project in supporting developing countries to achieve sustainable fisheries, and to eliminate IUU, which is funded by MAFF,” Okabe told SeafoodSource. The weaker yellowfin tuna supply picture from the Indian Ocean means European Union and Thailand-based canned tuna producers should make investments in plants in the Pacific, said Henk Brus, managing director of Pacifical. According to Brus, the effort to reduce yellowfin catches in the Indian Ocean by 15% will be the main driver of a 50,000-metric-ton shortfall for European processors in 2018/2019. Also, the eastern Pacific faces “disrupted supply”, due to the two-month ban per vessel and also a drive to reduce catching on fishing aggregation devices. This shortfall will need to be covered from the western and central Pacific, he said. 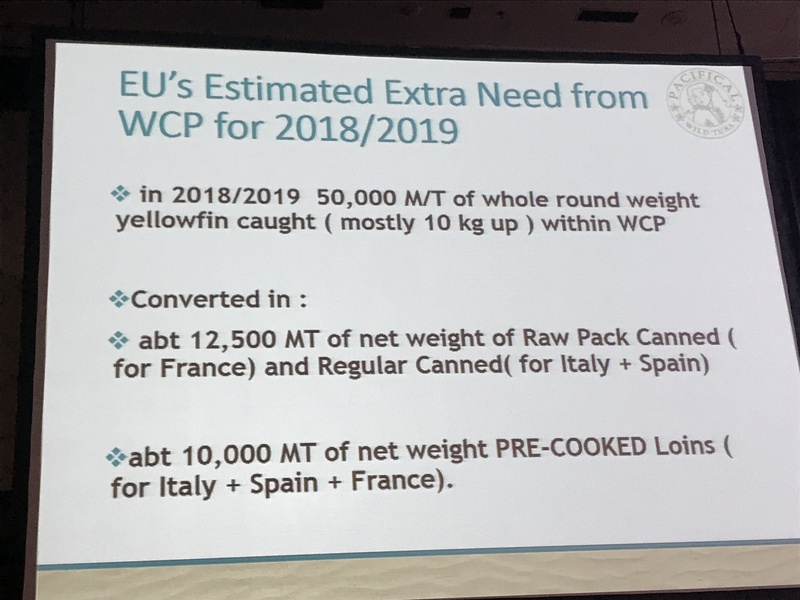 The EU will need big sizes of yellowfin, 10 kilograms and up, to cover the market need for 12,500t of net weight, raw packed canned tuna for France and regular cans for Italy and Spain. 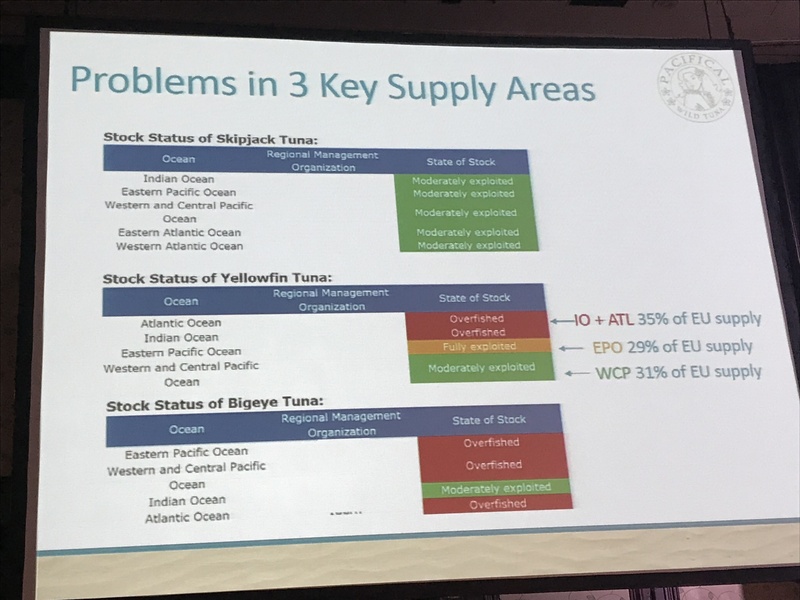 Then, Italy, Spain and France have a demand for about 10,000t of pre-cooked loins, said Brus, at the Infofish Tuna 2018 conference. 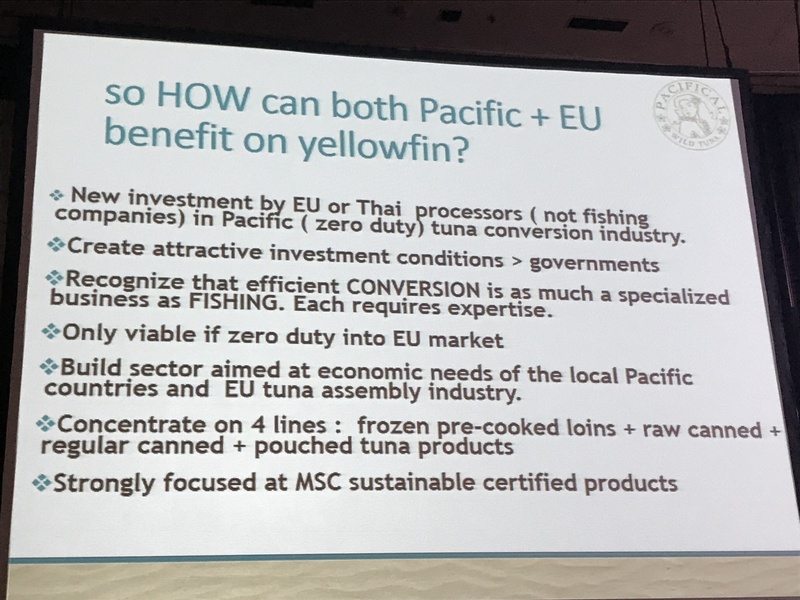 There is a need for yellowfin in the EU and the Pacific countries need expertise in processing, he said. So, this presents an opening to build a sector aimed at the economic needs of the Pacific countries and the EU assembly [processing] industry, he said. So, governments in the Pacific need to create attractive investment openings for processors from the EU and also Thailand, the world’s largest canned tuna producer, to invest, said Brus. A lot of the investments in plants in the Pacific seen so far have come from fishing companies, looking to get access to the tuna-rich Parties to the Nauru Agreement (PNA) waters, but Brus said he’d like to see more specialized processors come in. 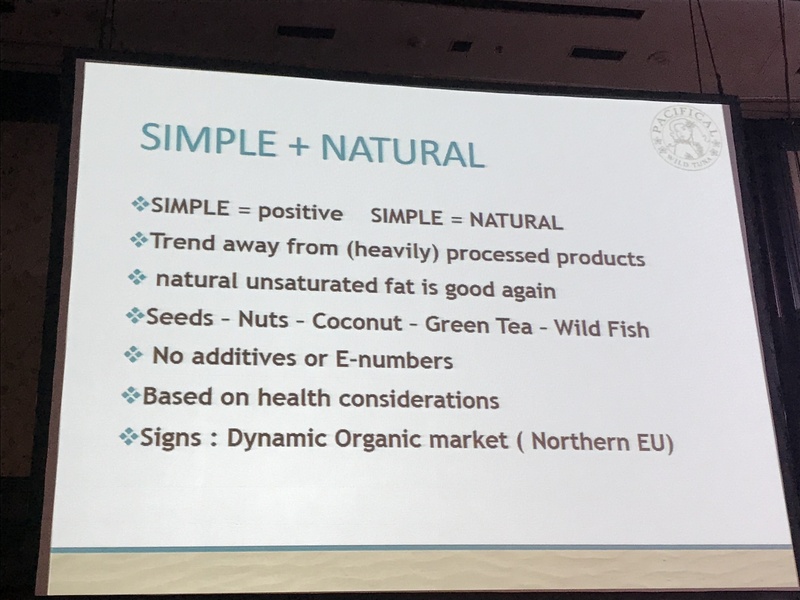 “There’s a distinct difference between companies focused on processing compared to canneries run by fishing companies, conversion [processing] is as much a specialized business as fishing,” said Brus. This industry that will develop in the Pacific needs to focus on four lines, frozen pre-cooked loins, raw canned, regular canned and pouched tuna, he said. There also needs to be a “strong focus” on Marine Stewardship Council (MSC) certified products, said Brus, whose Pacifical is the marketing arm for the eight Pacific Island countries that comprise the PNA. The PNA controls the largest MSC tuna fishery in the world, with both skipjack and yellowfin certified. If the EU is not able, or unwilling, to try and keep this yellowfin market going, there is an opening to switch more to skipjack. In fact, this is happening already, to some extent, in Spain and Italy, he said. 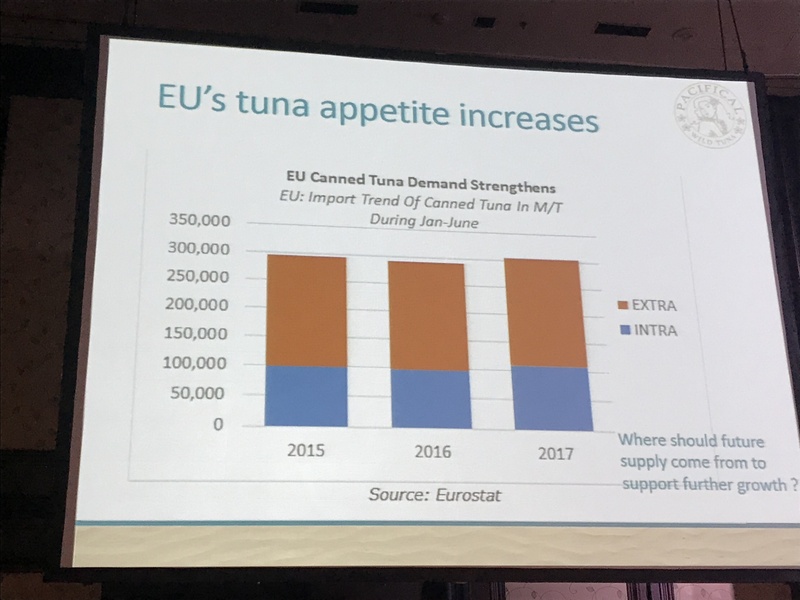 With skipjack stocks in a good position, retailers in southern Europe are labeling cans simply as “tuna”, not specifying the species, said Brus. Also, companies are reducing can sizes for yellowfin. 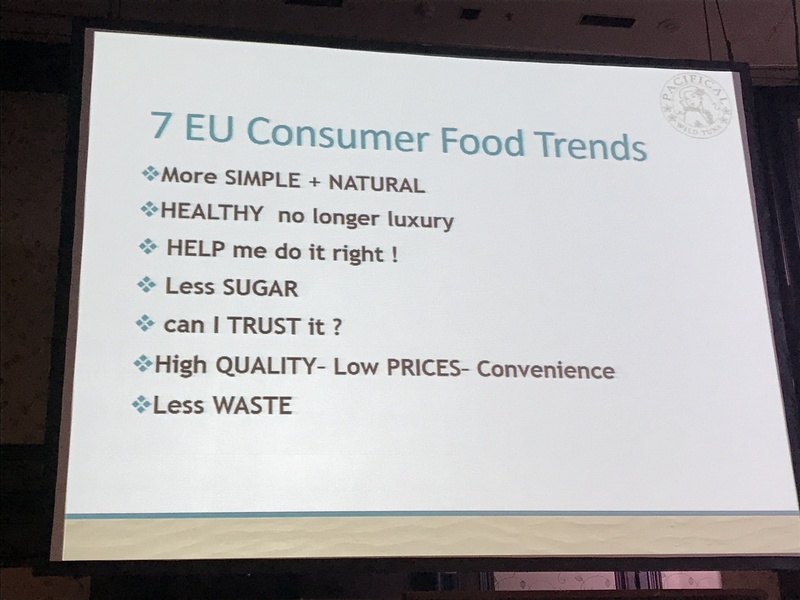 Although the EU has some supply issues, the market is in growth, supported by various trends highlighted by Brus, which you can see slides on below.